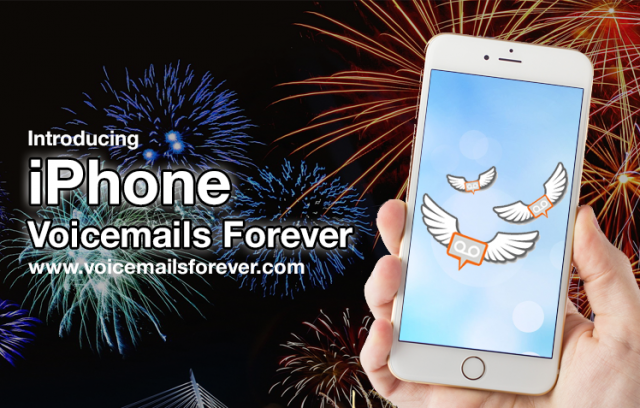 The Only Product Of Its Kind, Voicemails Forever Is Now The Only One Available For iPhone As Well! New York, NY- Voicemails Forever, the only product that allows you to instantly record, transfer and save voicemails as MP3 sound files right to your computer or the cloud announced today the launch of iPhone Voicemails Forever, the easiest way to transfer and permanently save iPhone voicemails – even the deleted ones. Additionally, before Voicemails Forever, there was no way to share Voicemails digitally. Now iPhone users can feel secure knowing their voicemails will always be safe, and those receiving a new iPhone for the holidays won’t have to lose precious voicemail memories. The response to Voicemails Forever has been overwhelming. In an age when communication has been stripped down to simple texts and digital posts, Voicemails Forever has proven that voicemails are as important as ever to capture the irreplaceable memories, thoughts, encouragement, and love that simply cannot be communicated or expressed through a text message. The iPhone version of Voicemails Forever is important and unique because people can finally access and share their voicemails from anywhere – this wasn’t possible before! Apple’s service still doesn’t allow direct access to voicemails or sharing capability, making Voicemails Forever a true necessity. Of the other similar services currently available, none offer an immediate voicemail copy into mp3, none offer cloud storage, and none offer live customer support. Voicemails Forever (www.voicemailsforever.com) is the only service that allows you to instantly record, transfer and save voicemails as MP3 sound files right to your computer or the cloud without the need for any hardware or software. With two levels of service, Voicemails express, and Voicemails Valet, Voicemails Forever allows the user to save voicemails in just minutes, download messages as mp3 or save to CD, record voicemail messages before upgrading phones, and is compatible with all cell phones, iPhones, smart phones & landlines. Voicemails Express is the Do-it-yourself, immediate voicemail retrieval service with plans starting at $19.99. Voicemails Valet is full service voicemail and delivery service with two options: voicemails delivered on a CD, or voicemails emailed to you MP3 files with plans starting at 29.99. For pricing and availability please visit www.voicemailsforever.com.